I missed this while I was on vacation, but don’t want to let it pass by: when it comes to median household wealth, the United States is near the bottom of the major OECD countries. Dylan Matthews had a nice post reviewing the data, including the graph below, at Wonkblog. Remember, wealth is the total value of a household’s assets (house, retirement savings, checking account, etc.) minus the total value of its debts (mortgage, student loans, credit-card balances, etc.). 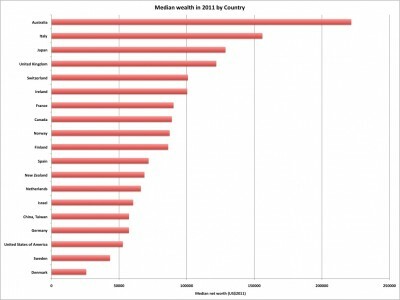 Median income in the United States would be near the top of the same group of countries. So, if we believe these wealth data (assembled by Credit Suisse and available here in pdf format), US households earn more, but still accumulate far less in wealth. As Matthews points out, this is likely a fairly long-standing relationship, not simply the result of the collapse of the housing bubble. In 2004-2005, as the bubble was still inflating, median wealth in Canada, for example, was already about 40 percent higher than it was in the United States. What accounts for the poor showing in the United States? There is a lot going on here (age structure of the population, different patterns of immigration, different roles for private versus public savings for retirement, and others), so it is hard to provide a simple explanation. But, I suspect that the single biggest factor is the highly unequal distribution of wealth in the United States, relative to these other comparable economies. 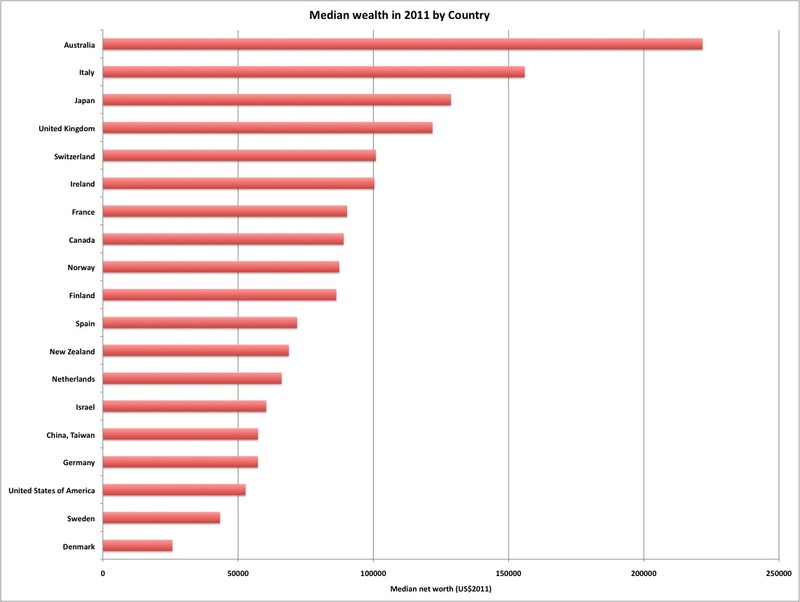 What about Denmark and Sweden, both of which have much more equal distributions of wealth than the United States? I’d guess that “public wealth” –not counted in the data above– makes up much of the difference. Danes and Swedes pay higher taxes during their working lives, but in exchange can look forward to generous pensions, comprehensive health care, and government-funded long-term elder care when they retire. « Why Don’t More Young People Go to College?